Hair loss can be an emotional and distressing challenge, making those afflicted feel particularly vulnerable. Hair loss affects both men and women. A question most commonly asked is: Is there a non-surgical procedure to grow more hair or slow down the process of hair loss ? One treatment for stimulating hair follicles is Micro Needling. Micro needling (Derma Rolling) is a non-surgical procedure and non-ablative treatment that stimulates your body’s natural healing response. 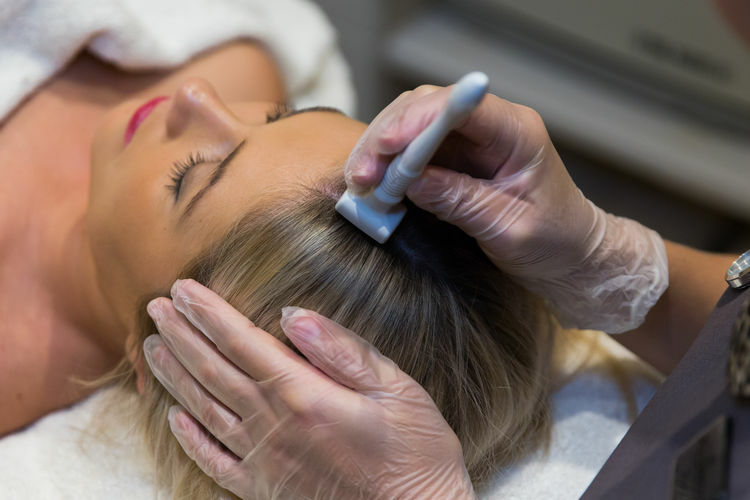 When used on the scalp, Micro needling causes pinprick bleeding, which in turn increases the levels of the same growth factors that make platelet-rich plasma and activates stem cells. Studies have shown that these controlled micro injuries not only form new tissue layers of elastin and collagen, but can also stimulate blood circulation and increases nutrients into your hair follicles resulting in hair growth. The stratum corneum on the scalp is not very thick, and can be penetrated by a 0.75mm to a 1.5mm depth microneedle or derma roller. These tiny channels allow more than 200% more active products to penetrate the scalp. The pores close within minutes, locking in topical treatment nutrients, while supporting skin renewal and a healthy scalp. By opening the skin in this way you dramatically increase the penetration of any topical growth product, like Rogaine, Monoxidil and PRP. Platelet-rich plasma (PRP) along with micro needling or skin needling could be considered an effective alternative therapy for patients who are not candidates or cannot tolerate Monoxidil.